Sometimes we all just need that ear to bend and brainstorm with someone! Maybe you are just not sure on a direction to go with your business! Maybe you are hung up on a branding concept! Need more personal help on how to get clients? 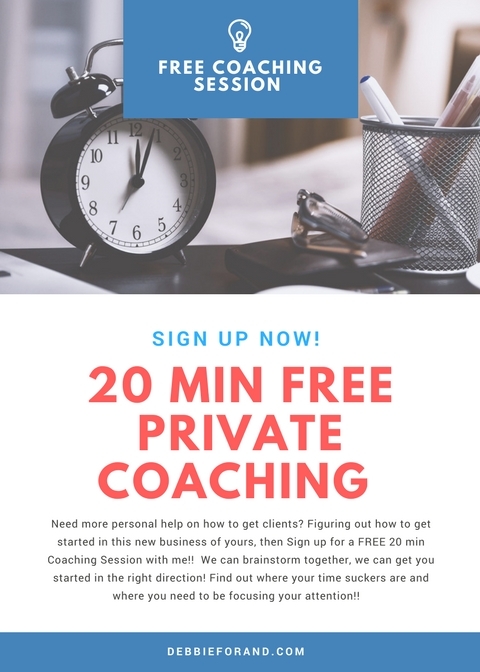 Figuring out how to get started in this new business of yours, then Sign up for a FREE 20 min Coaching Session with me!! We can brainstorm together, we can get you started in the right direction! Find out where your time suckers are and where you need to be focusing your attention!! Whatever it is that is holding you back, talking it out with someone and getting ideas on how to move forward and get unstuck is exactly what a coach is for!! CLICK HERE TO SCHEDULE YOUR 20 MINS FREE SESSION! !